As you can see some posts below I tried to convert this small tray from Steffor for several times but the glass was never showing up! Finally I could see that it was a problem with the bones assignment oh well.. it’s everything fine now! 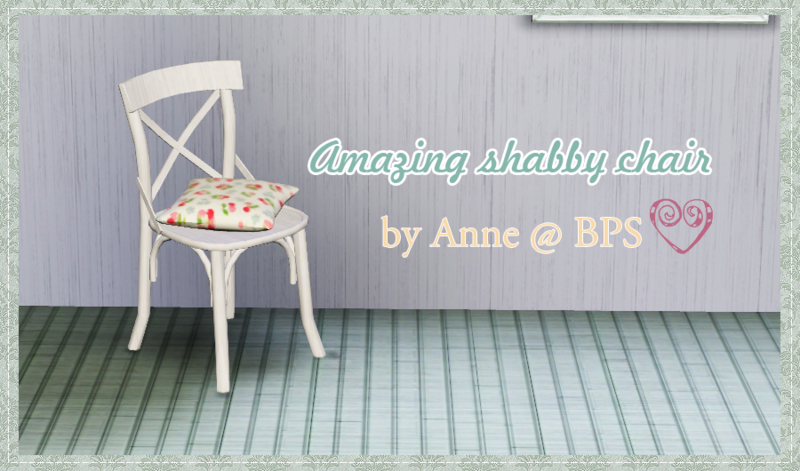 The same thing for this lovely shabby chair from Anna. (I want the same chairs on my kitchen!!) Don’t you think it is cute? I didn’t convert the table because this chair goes perfectly with Pocci’s table and the less cc, the better, right? Ah and it goes also very well with my Cath Kidston patterns, if you don’t have them yet don’t forget to grab them here! I hope you’ll enjoy them and make amazing houses!! Click on the floppy disc to download for patch 1.26/1.27 and pets. Fixed with TSR Rig fix tool. Ok… I love you! I love that chair. And you are going to HAVE to teach me how to convert furniture. Well thats fabulous that you got it to work right! They both look Lovely! Thanks Camille! it,it confuses me lol Oh well! I love this! ♥ This is very very pretty! Your conversions are perfect! They make me want to download. RD, I just posted the trick on your blog. And thank you for the awesome paintings! I'm downloading them!! OMG ! its so cute XD superb ! Hey Camille, I sent you and email. Hey I'm sorry you did not get my email. I wanted to know how you got featured on My sims 3 blog and sims3updates.net? I've been trying to get my sims featured but they won't do it. wow.. those are really nice 3d works.. I can only say one thing: you're so good at what your doing! Those are really cute and artistic of you. I hope I know how to make them too.